Fantastic! Dont ya just love it when it does that ? It never ceases to amaze me how it does it and yet there it is posted real time - for all to see! This Ftse100 head and shoulders pattern is another text book example of the stuff that we do here and the next time some one tells you that Technical Analysi is a load of mumbo jumbo, please feel free to point them is this direction. Not only did the initial chart call for an imediate reversal back up from that scary drop on 28thApr, it forcast the price level where it would reverse back down again and then it told us where the Ftse100 was going from there......and when! It just doesn't get any better than that folks! 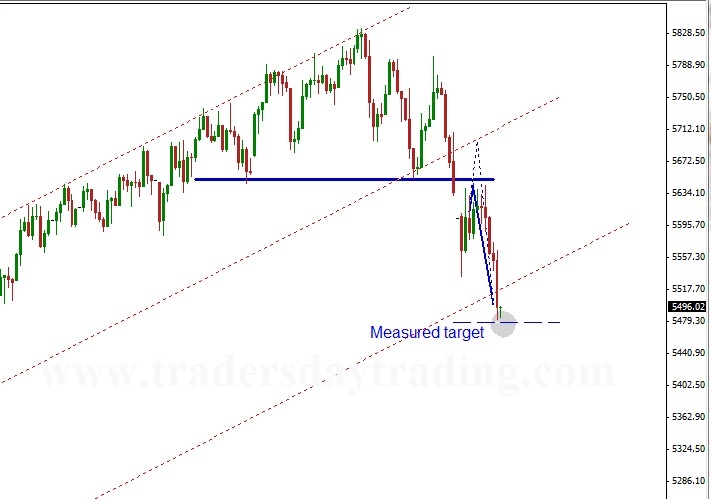 We already discussed that Head and Shoulders patterns are topping patterns, so the fact that it competed and confirmed itself as a valid pattern backs up our position that we think the markets are rolling over for a chunky decline from here. What we want to see now is for price to continue to stick below the neckline but there may be a bit relief rally now that the target completed but there is no way to know for sure the exact path from here as much now depends on shorter term analysis. This is why these relatively short term Head and Shoulders charts were posted here in the long term analysis discussion thread. This one is only on a 4hr candlestick chart but these are topping patterns so does trigger a longer term signal. Short term are best to take profits here, but swing traders and long term traders can run the trades accordingly with the appropriate stops in place. Head and Shoulders Target .